DowDuPont: Don’t Spin Off Worker Rights! IndustriALL Global Union and its affiliates throughout the world call for support in demanding chemicals giant DowDuPont to respect workers’ rights through its current spin-off process. Members of IndustriALL-affiliated trade unions representing DowDuPont workers in North and South America, Europe and Asia, are facing great upheaval as the newly merged company splits into three separate segments. The demand is to have a seat at the decision-making table through this period of change. The company was formed in August last year after a US$150 billion merger between Delaware-based DuPont and Michigan’s Dow Chemicals. The three new spin-off companies will be in these industries: Specialty Products, Material Sciences, and Agriculture. Each of the three is cutting costs by around US$1 billion. Through this restructuring, management’s cost savings goal is $3.3 billion. The company calls this the “cost synergy number”. The network argues that this cannot come from employees. DowDuPont is posting massive increases in earnings, with sales up by 13-percent. International trade union networking at DowDuPont has been conducted since the merger, and will continue. A large meeting of the network will take place on 9-12 October. 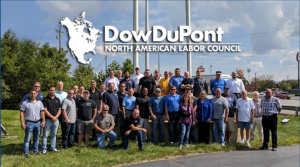 Click here to access the online petition calling on DowDuPont to respect their workers, and not just the shareholders at this important time.